You know, I have a love-hate relationship with technology. I'm sure those Sontarans put the mockers on my viewing of this episode. The Sky box crashed after failing to record the episode tonight. When satellite boxes fail I'd definitely class myself as one of the many Britons who have a prevailing pessimistic disposition towards technology. And Doctor Who has always enjoyed fuelling this disappointment with its own take on the perils of new technologies and new ideas. Just look at what the new series has already managed to blemish; mobile phone networks, bluetooth attachments, power stations, computers; and now the much maligned Sat-Nav, the evils of cloning and catalytic converters. 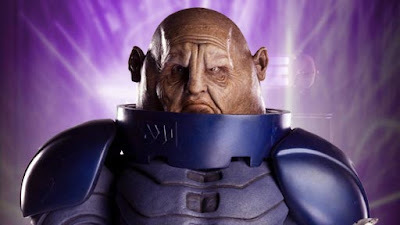 In fact, 'The Sontaran Stratagem' is honestly so in love with the relative merits, both good and bad, of new technology its like it's taken it out on a date and then thrown a drink over its head for not getting down on one knee to propose. Here we are talking about technological might and the abuse of power and how innovations can offer individuals considerable influence outside of industry in the course of human affairs. The Rattigan Academy, with Ryan Sampson's Luke Rattigan coming on all Bill Gates to a bunch of genius kids, is pretty much about how technology devcelops autonomously. It feeds on itself and becomes irresistible to consumers who simply don't consider the responsibility that goes hand in hand with new developments. Luke Rattigan, an unfortunate 'boy genius' SF cliche, is someone we should be scared of. He's essentially practicising a form of eugenics and his Academy is pure Robert Klark Graham, the American millionaire who tried to collect sperm from Nobel laureates and breed an entire generation of geniuses, and that other pariah William Shockley, a giant of Silicon Valley and one of Graham's 'offspring'. Trouble is, Ryan Sampson plays it just like so many other cliched child geniuses in film and television (yes, I'm looking at you Sarah Jane Adventures) and Helen Raynor's writing barely addresses these ideas that its rather disappointing. That's the problem with these two-parters though. They are murder to write. It's difficult to pull off the necessary action, spectacle, subtexts and character development especially when most of the formula here is feeling a tad stale. We've had the companion returning home in 'Aliens Of London', 'The Lazarus Experiment', we've had the phobias about technology and we've had alien invasions galore so this does feel like a retread. The plus here is that we do get the 'evil doppelganger' of Martha and that's a new one for the series. It's perfectly enjoyable for 45 minutes, a good, pacy set-up for the second part. There are some very delightful and well written scenes - Donna having a go at flying the TARDIS and the nod to 'denting the 1980s' which this story literally does in its retro Pertwee UNIT vibe and Saward like obsession with the military; the faux 'I'm going home' exchange between her and the Doctor which is one of the best played scenes from Tate and Tennant; and the whole reunion with Wilf and Sylvia which again relies on some affecting interplay between Tate and the wonderful Bernard Cribbins and would have been even better if they'd decided not to treat the audience like imbeciles and flashed us back through Donna's Greatest Hits. Tate's playing of Donna gets better with each episode and I really loved the warmth between her and Tennant. Freema is not as good as she was in Torchwood's 'Reset' and this confident and strident version of Martha suffers slightly with some poor line delivery but it is still good to see her and the sub-plot of her cloning will hopefully give her an opportunity to stretch her acting muscles. Tennant is much better in this story, almost teetering into the manic performances of his early episodes, and his barbed attitude towards Colonel Mace (Rupert Holliday-Evans is a very poor man's Brigadier, it has to be said) and UNIT's emergence from its 'homespun' origins and the later rather smashing scene where he corrects Rattigan's grammar and wields a squash racket to whallop Staal's probic vent (shades of the satsuma bowling in 'The Christmas Invasion') finally prove that he isn't on auto-pilot this series. The script is littered with funny lines and good character moments for the Doctor, Donna and Martha but it doesn't serve the other human characters that well. Plenty of continuity references too and perhaps a cheeky answer to that thorny question of dating the UNIT stories with that "Back in the seventies. Or was it the eighties? It was all a bit more . . . homespun back then" line and more mentions of the Time War and the Medusa Cascade. Personally, I feel that the 'homespun' UNIT of Lethbridge-Stewart, Benton and Yates is in no danger of being eclipsed by Mace and his rather anodyne sidekicks of Ross, Gray and Harris especially with their 'Homeworld Security' agenda of roughing up Polish factory workers, much to Donna's chagrin. It's a Bush 'New World Order' version of UNIT already hinted at in Torchwood and if they carry on like this I suspect the Doctor will resign his position. However, Helen Raynor does triumphantly reposition the Sontarans rightfully amongst the best of the returning classic series monsters. She manages to create a memorable foe in General Staal and feeds him with the kind of dialogue we haven't heard Sontarans utter since 'The Time Warrior' or 'The Sontaran Experiment'. Christopher Ryan seizes the opportunity and makes Staal into a wonderfully erudite, bombastic military leader completely fixated on war. And the redesign of the costumes and prosthetics does work effectively to enhance Ryan's performance and obliterates the rather feeble efforts of 'The Two Doctors'. Couple that with the rather lovely CGI effects for the warship and the scout vessels nipping around it and its safe to say that the school playgrounds of Britain will soon be ringing with Sontaran chants. The cliffhaner goes on for far too long and I'm sure most viewers would have been urging the Doctor or Donna to simply smash the car windows in with a blunt instrument of some description. Douglas Mackinnon directs in a suitably epic manner but with a little less confidence than some of the more seasoned directors on the show and I did feel that some of the lighting wasn't up to the usual standard and there was an over reliance on the more gharish schemes you would associate with 'Sarah Jane Adventures'. The overall impression is of a rather gaudy, fast paced comic strip. With this more or less just the sum of its better parts, the story is now having to rely on an equally strong or better second part if Helen Raynor wishes to avoid the disappointment of her previous efforts with the Daleks. 'Get a brick! Just get a brick!' I was yelling. Ah well, I'm sure it'll turn out ok. It all hinges on part two, as you indicate, but I really enjoyed last nights episode. Nice blog by the way, I've just slinked across from Behind the Sofa but I think I'll be popping back in the future. I'll try that again. Seeing as I couldn't string two words together. Yeah, thanks for the comments and popping in. Let's see what the second part brings. "That's the problem with these two-parters though. They are murder to write. It's difficult to pull off the necessary action, spectacle, subtexts and character development especially when most of the formula here is feeling a tad stale." They do seem to be hard to write nowadays, for some reason, although surely they're the equivalent of what used to be a 4-parter? Having recently watched "Meglos" and "Enlightenment" (both for the first time, by the way) I have to say that those writers didn't seem to have any problem filling 90 minutes with stories that didn't seem padded or rushed; nor did they seem particularly stale (give or take the odd manic laugh). There is a structural issue too. An 'old skool' four parter will actually have three cliffhangers. A current two-parter only has one and therefore the peaks and troughs of the drama are I expect rather different. Even so, 'Meglos' and 'Enlightenment' do suffer from padding I think. 'The Sontaran Stratagem', for its perceived faults, is actually a very lean script and the second part is allegedly going at full tilt. Maybe Helen Raynor has finally succeeded this year. Many thanks. You're welcome. Glad to hear you're introducing a new generation to such delights as 'Robots'!